Does Viewsonic's ViewPad 7x prove that small tablets are more juicy? Viewsonic's ViewPad 7x might be too heavy for some but it is more portable than most tablets, is well priced and packed with top end specs. 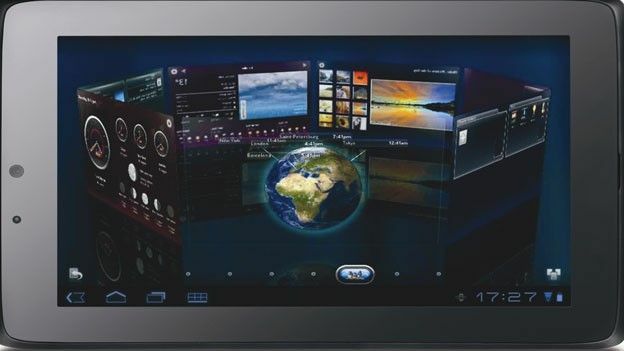 Unlike the Sony Tablet S and the king of all tablets, the Apple iPad 2, the Viewpad 7x comes loaded with an affordable price tag. Well, just about. Along with the Acer Iconia, this is one of the smaller tablets in this round-up, but don't judge the ViewPad 7x on its size. It's just as powerful as more bulky models, with the same nVidia Tegra 2 processor in place. We love the compact body, which fits perfectly in the hands thanks to its curved edges, and at 390g it's light enough to hold one-handed without giving you nasty cramp. The glossy body picks up fingerprints and scuff marks rather easily, but looks smart otherwise. The 7-inch screen is impressively vibrant, as you'd expect from a company that makes televisions. Viewing angles are strong unless you tilt the tablet downwards, which immediately darkens the image, but photos appear razor-sharp thanks to the 1024 x 600-pixel resolution. Android Honeycomb's seven desktops come pre-filled with widgets, includingFlickr's picture of the day and an in-depth weather app. Annoyingly you can't customise the first three windows, so you're limited to four panels for your own bookmarks and doohickeys. Still, we liked Viewsonic's virtual 3D wheel, which lets you quickly switch between the different desktops. It's a smart addition to an excellent tablet interface. The rear camera is sharp enough to take decent pics in bright light, but even with the flash it's abysmal in dim interiors. Still, at least the ViewPad is compact enough to comfortably wield as a camera, unlike its 10-inch brethren. You get 8GB of storage for storing your pics and other media, expandable via the Micro SD card slot. Movies and games don't just look good, they also sound great thanks to the impressive power of the built-in speakers. We watched HD films for almost four and a half hours on full brightness before the battery died, an impressive effort that destroys the similarly-sized Acer Iconia Tab A100. With its compact build and excellent battery life, this surprisingly powerful tablet is one of the most portable yet.